Amazing Big Sky Views, Loyal Guests, and Over 2000 sq ft Owners’s Quarters! You don’t want to miss this opportunity! The Bitterroot River B and B is a profitable, turn key business that offers guests an authentic Montana Experience. In the Bitterroot Valley, you can enjoy some of Montana’s best fly fishing, hiking, kayaking, skiing, and wildlife viewing, without the crowds of the national parks! With stunning views of St Mary’s Peak and the Bitterroot River, this water front property hosts 4 guest rooms and 4 private baths. Guests enjoy a year round sun room facing the river, 3 gas fireplaces, den and an outdoor wrap around porch. The owners have a private suite that is over 2000 sq feet, including a dining area, 3 large dens, private deck, 2 bedrooms and 1 full bath. There is even a laundry shoot to make your days easier! The beautiful 2+ acre grounds outside offer the option of a hobby farm that has wildlife friendly fencing, as well as, an established organic berry garden and fire pit with benches. You will want to keep your camera handy! Montana wildlife such as Deer, Elk, Moose,Mountain Lions, Coyote, Wolves, Bears roam the area and are often seen by guests. The inn enjoys the peace and quiet of small town living. yet, is within walking distance to modern micro breweries, numerous restaurants including fine dining, and entertainment.The Town of Stevensville boasts two great groceries stores which feature organic and local produce, as well as, numerous other shopping opportunities. The inn has an established food delivery service for most supplies. The inn is conveniently located less than half hour from Missoula International Airport and major shopping opportunities, such as big box stores and malls. The Bitterroot River B and B was just featured in the Missoulian Newspaper! The inn is a two time recipient of the “Best of the Bitterroot” Award and several other recognitions. This is a unique opportunity to continue a thriving business in the heart of Stevensville on the Bitterroot River! Conveniently located less than half hour from Missoula International Airport. The Town of Stevensville is considered the “banana belt” of Montana. The winters are much milder in the Bitterroot Valley than in most portions of Montana. The bed and breakfast guest areas come fully furnished, including the living room and sun room. The kitchen comes equipped with everything you need to cook and serve breakfast. A one month training period for the new owners in the B and B business is included and will be facilitated by the sellers. Helpful information such as a list of established food service providers, sample menus, recipes and food costing, etc will be included in the training. An aspiring inn keeper training class will be presented by the Montana Bed and Breakfast Association in April 2019. 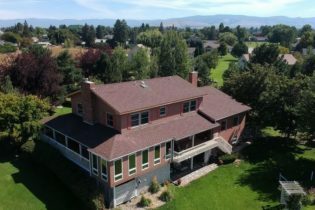 The Bitterroot River Bed and Breakfast was established in 2005 and is well recognized in the community. The inn also has a strong internet presence. Summer occupancy averages 80-90%. Total annual occupancy averages 54%. Inn has shown consistent growth each year and has potential to increase significantly. Our clientele include fly fishermen, tourist, and a high rate of return guest, most which are visiting family located in the area. We hate to let this amazing opportunity slip by! We must sell due to owner’s unexpected disability. Open house scheduled 03/24/2019. MLS #21811298 Please call Aly with any questions you may have.